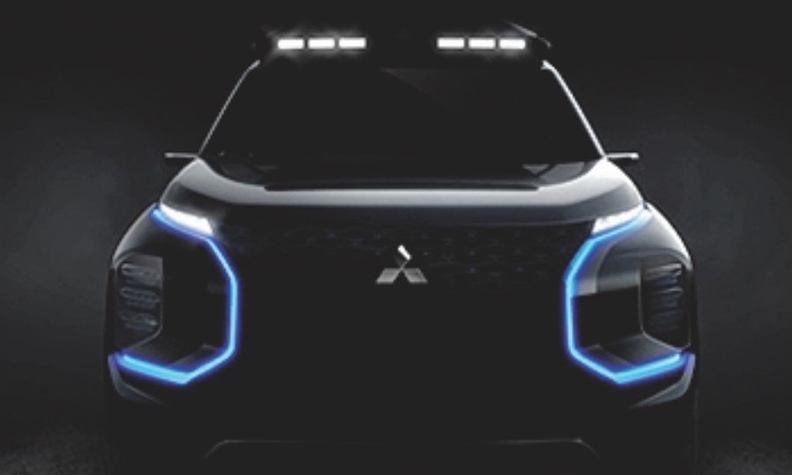 TOKYO — Weeks ahead of the Geneva auto show, Mitsubishi Motors Corp. is teasing a crossover concept that hints at the automaker's plans for freshening its product line. Mitsubishi calls the upcoming concept the Engelberg Tourer, and says it is named after the Swiss alpine ski resort town. The vehicle represents Mitsubishi's two top priorities for future product development: a focus on crossovers and more electrified drivetrains. Mitsubishi product planning has begun to benefit from its global financial tie-up with Nissan and Renault. Officials with the alliance have indicated that Mitsubishi will gain access to vehicle platforms being produced or planned by the other alliance partners, both of which are well invested in electric vehicles. In a statement last week, Mitsubishi said it wants to bring "more SUV, more EV, more technology and more style." Judging from the company's teaser photo, it also wants to bring more light. The image shows Mitsubishi's split-level headlights as well as safari-style roof lights. The company did not reveal specifics of its plan, but the concept's overall styling seems to build on the e-Evolution Concept shown at the 2017 Tokyo show with a bold expression of the brand's Dynamic Shield front fascia. Mitsubishi said it will unveil the Engelberg Tourer on March 5 at the Geneva show.